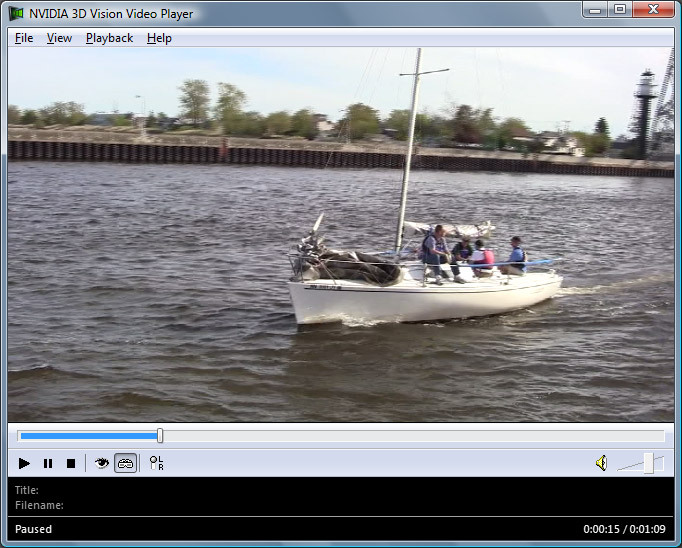 The user 3D Frank from the Nvidia 3D Vision Forum has shared another interesting stereo 3D video that he made, this time instead of a Bear Encounter he recorded some boats sailing into the sea. The video is in a Side by Side format in 1080p half horizontal resolution (squashed), so you need to select 16:9 aspect ratio in the 3D Vision Video Player and enable deinterlacing. It has been recorded with a custom 3D rig using two Canon Vixia HF S21 digital cameras, controlled with a LANC Shepherd Pro in order to have them perfectly synchronized. Don’t forget to leave your comments if you download and watch this short video and also if you shot or created some stereo 3D videos or 3D photos yourself and want to share them with other people, don’t hesitate do drop me a line, write in the comments below or in the forum, so they can be featured on the website and reach more people. How do I get this file to play in Nvidia’s 3D player? You need to convert it to WVM. Nvidia’s 3D Player ha serious troubles with codecs different from DivX or WMV. Some people say they did managed to make them work… I have Windows 7 64bit and I’ve never been able to play a M2T file so far. I’ve just published a short guide in the blog with a workaround using a simple AviSynth script to that may help you when you have problems with playing back stereo 3D videos in the 3D Vision Video Player or the Stereoscopic Player. There are some disturbing effects with the waves. Is there a bad sync between left/right eyes ? I have Windows 7 64bit and I’ve never been able to play a M2T file so far.